The organisers of the Abidjan international tournament featuring two clubs from African continent and another two from South America (Brazil) and Europe (UK) respectively has released the program below, capturing the activities between Sept 14th and 20th. 14th Sept 2010 – Teams will assemble at Hotel IBIS Abidjan-Plateau. 15th Sept 2010 – Orientation of all teams at the hotel between 18h00-19h15. 16th Sept 2010 – Tournament starts with two matches. 17th Sept 2010 – Excursions to touristic sites starting from 10h00 back at 17h10. 19th Sept 2010 – Third place play off at 17h00, finals at 19h00, Gala diner from 21h00 to 23h00. 20th Sept 2010 – Teams to depart back to their respective Nations. Gor Mahia FC has landed an invitation to participate in a four club international tournament to be played in Abidjan Cote d’ Ivoire between September 14th and 20th 2010. This is a fully paid trip for a contingent of 25 organised by Santa Cruz FC of Cote d’Ivoire. The other two clubs invited are Clube Cruzeiro Belo Horizonte of Brazil and FC Ashford Town of UK. Elated Gor Mahia Chairman Ambrose Rachier could not hide his joy saying that the invitation could not have come at a better time than this following the rich vein of form the club is currently enjoying. Two weeks ago, Gor Mahia drubbed Chemelil Sugar 4-1 before dismissing the then leaders of the Kenyan Premier league Tusker FC 2-0 a week later in a match watched by one of the biggest crowd only witnessed in Kenyan soccer of 80s. 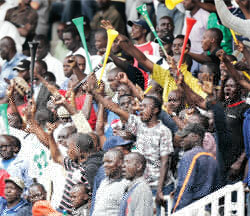 Gor Mahia fans have a lot to cheer for over the last week. 8 days ago the they put Chemelil to the sword, beating then 4-1, thus earning a measure of revenge against the team that soundly beat them in leg 1. They followed it up this past Sunday with an emphatic 2-0 win over league leaders Tusker. Beating Tusker is perhaps the biggest accomplishement of the season and it electrified Kogalo fans all over the country and abroad. Fans broke into song and dance at the stadium. There was a myriad of celebratory text messages being exchanged between fans in the aftermath. Gor Mahia being in 3rd position slightly passed the halfway point of the league is perhaps the biggest achievement the team has accomplished in the local league since they finished runners up to Utalii in 1997. The next year 1998 was the beginning of the quagmire of incompetence and poor leadership that saw Kogalo pluunge previously unimaginable depths. This culminated in the relegation of the team twice (2002 and 2004) under the leadership of one Erastus Okul. In 2004, Kogalo was destined for the lower divisions and was only saved from the ignominy of relegation by the fact that Nzoia FC was disbanded thus opening up a spot for Kogalo in the top tier league. Who knows if the club would have recovered. Perhaps we would have gone the way of Re-Union or Shabana. Jackson Mureu, Nick Otieno and Benard Odhiambo celebrate an equalizing goal during a league match. There was’nt however much to celebrate during the 2002 season and many will want to forget it quickly. Today however Kogalo are playing the most attractive football in the league. Both national dailies have said as much. Whereas this attractive football did not always yield results during the 1st leg, Kogalo have shown the cutting edge in the past two games. Whats impressive is the fact that this teamis perhaps the youngest team in the league. However the maturity and composure shown by these youngstars has been a joy to watch. They play so well together, one would be forgiven for thinking that they have been playing together for years. Baldwin Ngwa seems to have developed a telepathic understanding with Blackberry and can find the latter even when facing the wrong direction. Duncan Makori provides much needed width and has shown an ability to cross with either foot a la Sammy Onyango “Jogoo” hapo zamani. The midfield of Opiyo, Collins, Ocholla and Okumu work relentlessly to stifle opposing playmakers. Musa Mohammed has shown an ability to man mark the best attackers in the league as he showed when he shut down Paul Were. Masika, Awilo and Ongwae all complete a much improved defence shielding Jerim in goal. Lets now hope that coach Zico can continue to work his magic. Another area of improvement has been fan support. Whereas in the past fans were demanding and only cheered when the team did well, this new set of fans gets behind the team whether they are winning or not and acts as a crucial 12th man. And now more and more fans are returning as word spreads about the exciting brand of football on display when Kogalo plays. Not only was the Russia section full this Sunday, but the standing room only section (Soweto) was also packed. Its been a long time since we saw this. Back in March when we first posted this article, many fans disagreed. The club was not doing well and Blackberry was struggling to find his form. Now that Blackberry has regained the sparkling form that saw win several awards last season, perhaps some of you will change your mind ? The year was 1979. And Nahashon Oluoch was a form six student at Highway secondary school. Gor Mahia had a strong unit that would later capture the imagination of the Kenyan public by reaching the final of the Africa cup winners cup and by winning the national league. It was a unit that had players like the legendary Allan Thigo, a midfield maestro per supreme, Andrew Obunga, a prolific goal scorer, Mike Ogolla “Machine”, John “Bobby” Ogolla, no doubt the best stopper ever to play in Kenya and another rising super nova by the name of Sammy Owino, who was nick named “Kempes”. Nahashon Oluoch was nicknamed “Lule” after the Ugandan president at the time. The Kenyan press dubbed him the school boy wonderboy. To this day, Kenyans still think he is the best left winger Kenya has ever seen. Lule was named one of the top 10 players on the continent in 1979 by CAF. Amazing considering he was still a secondary school student. In watching George Odhiambo “Blackberry” over the past year or so, one sees many similarities. Both are attackers who operate primarily on the left wing. Both are excellent dribblers capable of slicing defenses with their mazy footwork. Both score frequently was evidenced by Blackberry finishing among the league’s leading scorers. And both have captured the imagination of the public by making it into the national team while still in secondary school. Blackberry has a while to go before he can fully catch up with the exploits of Lule. Not only did Lule help steer the club to the Africa cup winners cup final, but he was also named as one of the top 10 African players in 1979, quite a feat for a youngster still in secondary school. A month later, at the CECAFA club cup final in Blantyre Malawi, he scored the winning goal as Gor Mahia beat arch rivals AFC Leopards in an all Kenyan final to lift the cup. But blackberry shall get their with hard work. Lule and compatriot Sammy Owino Kempes left for the USA on football scholarships in 1982, breaking the hearts of Kogalo supporters who nevertheless wished them well. They joined Alabama A&M University. In 1984 with Lule and Kempes in their roster, Alabama A&M was ranked the top college team in the United states. Kogalo fans will be hoping that Blackberry can help steer the club to greater heights and restore the club back to its mighty heights. Kenyan fans will be hoping that Blackberry can join a top tier club in Europe where he can showcase his playing skills. In a match played in fromt of a large crowd, a goal in each half enabled Kogalo to sink league leaders Tusker by 2 goals to nil. The team seems to have hit a rich vein of form, following hot on the heels of their 4-1 demolition of Chemelil last week. Kevin Omondi notched the second goal when he finished off a swift counter attacking move in the 86th minute. Baldwin Ngwa picked up a through ball from Francis Ocholla. He then squared to George Odhiambo who in turn back heeled to Kevin Omondi. Upon finding himself with wide open space, Omondi planted the ball safely in the far corner of the net, leaving the Tusker keeper hopeless. The win saw Kogalo climb to 3rd position, only 5 points behind the new league leaders, Ulinzi. The win also came just as Tusker coach James Nandwa was quoted in the papers as saying that he did not think that the young Kogalo players had what it takes to challenge for the league. Renewed optimisn now encapsulates the Kogalo faithful who see an opportunity to regain the glory they havent seen in a decade and a half. National U-20 coach Vincent Ombiji named a 42 player team that will travel to Sudan to play in an Africa cup qualifier. The Kogalo players in the team are Musa Mohammed, Duncan Owiti and Anthony Akumu. A surprise exclusion from the team is Kevin Omondi who last year was voted the most valuable player at the national secondary school games as he led Langata high to the national title. A month ago he scored from a free kick giving Kogalo 3 valuable points against Sher. Midfielder Akumu who is nicknamed Viera has delighted fans with his ability to curve open opposing defences with precise passes and excellent runs. Musa Mohammed who is the younger brother to nationally reknown boxer Fatima Zarika has played a pivotal role in the Kogalo defence this year ever since he joined from FISA academy. He is also a product of Langata secondary school. Coach Zedekiah Otieno “Zico” has described him as highly disciplined and a good tackler. At 19, he has emerged as one of the best defenders in the league. Duncan Owiti has proven himself as a reliable goal peacher with the ability to place himself in the right place at the right time to notch crucial goals. He is a product of Nyanza province giants Thur Gem secondary school where he played alongside Blackberry. Owiti injured his hand before the season break and may be available to the U-20 for future matches. Gor Mahia recovered from a disatrous first round exit from the Presidents Cup to destroy Chemelil 4-1 at the Nairobi city stadium. Cheered on by a large crowd, Kogalo seized the initiative as early as the 8th minute when “Blackberry” Odhiambo finished off a move by Camerounian Baldwin Ngwa. Chemelil leveled the score via a spot kick in the 39th minute. 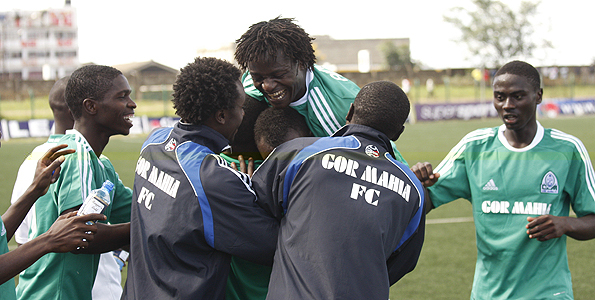 Kogalo were back on top when from a converted a penalty after a foul on Kevin Omondi. Further goals by Blackberry and Dan Makori buried Chemelil. The match saw the appearance of new signings Collins Okoth and Abdimaalik Mohammed, both of whom gave fans a lot to cheer with their stellar play. Gor Mahia are now placed 4th in the standings, six points behind league leaders Tusker. The onus is on club officials and fans to provide the team with moral, material and financial support to enable to keep up this rare form. Gor Mahia went down 0-1 to Red Berets at Nakuru’s Afraha stadium thus putting paid to their chances of competing in next years continental events, much to the chagrin of Kogalo fans. The match featured a number of new signings including the new sensation from North Eastern province, Abdimaalik Mohammed. However the combination did not work, leaving many Koogalo fans wondering why the technical bench used this important match to experiment with new players. No other KPL teams were eliminated. Arch rivals AFC leopards received a bye into the 2nd round.